For Valentines, I friend and I got together and helped our little guys make some adorable artwork (check out our adventures here!). The crafts were fun, but the one thing the boys kept wanting to do was put their paint covered fingers in their mouths. We moms had to spend the whole time watching out for their paint-eating tendencies. I determined to figure out an edible finger paint recipe before we crafted with the little dudes again. I tried several from Pinterest, but I haven’t been impressed with their consistency – many are clumpy or too thick. 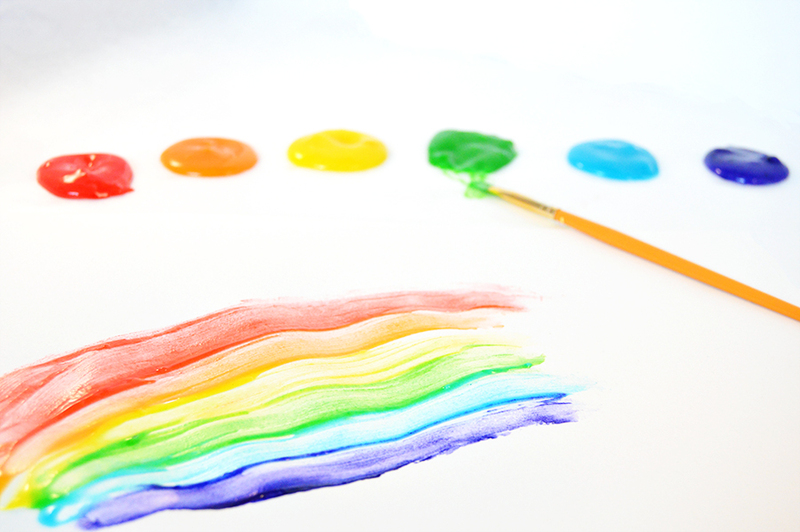 The yogurt paints work nicely, but they don’t dry, so you can’t keep your kiddo’s art work. Anyway, I played around during naptime and came up with this recipe. It’s the perfect consistency (just like real paint!) and takes color really well. It dries in about a half and hour and stays vibrant, making it perfect for kiddie projects. Watch out Saint Patrick’s Day! We’re gonna paint something green! Four ingredients gives you the perfect finger paints! Combine flour, salt, and 1 cup water in sauce pan. Heat flour/water while whisking. The mixture will be clumpy, then smooth, then thicken into a paste. Once it has become thick and pasty, remove from heat. Whisk in cold water a few tablespoons at a time until desired consistency is reached. 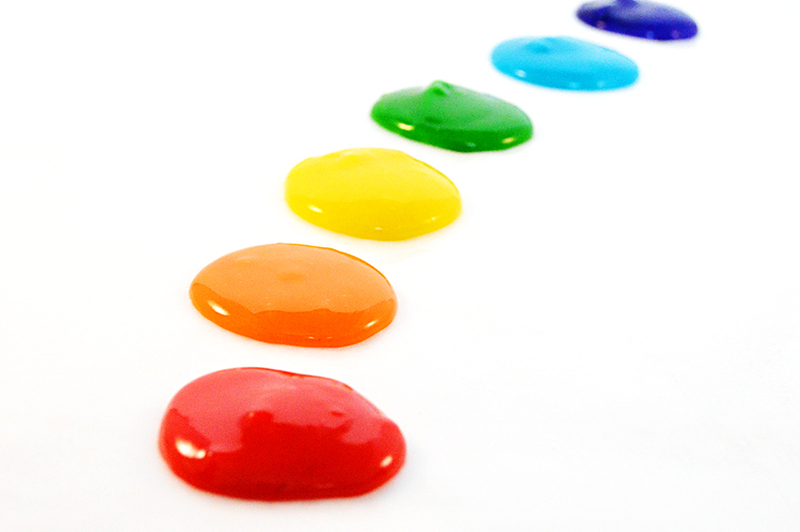 Color with food coloring or water colors. Allow to cool completely, then paint! I use Wilton gel colors to get that gorgeous vibrancy. This means that they will stain, but since Alex only paints in his diaper, that's no problem! To get my paint to the right consistency, I usually have to use 1/2 cup of cold water or more. Do you have a favorite edible paint recipe? Leave a comment and share with us! This looks like a great recipe, but didn’t see where you used the salt. Thanks for pointing that out! The salt goes in the first step with the water and flour. I think the recipe reads right now. How about the amount of salt to use? I might be missing it but I can’t seem to figure that part out!! 🙂 Thanks!! Thanks for letting me know. It’s a 1/4 tsp salt (you don’t need very much – it just keeps the paint from getting too crusty with the flour). Good to know for next time! I used an 1/8 cup Thinking maybe the salty flavor would keep him for liking it too much!! Did a test peice — seems to have dried okay but likely why I had to add so much (at least a cup) water to thin at the end!! Looking fwd to a cute Father’s Day card — thanks again!! How do you store this and how long can you store it for? I want to use this for my daughter’s birthday party, but I want to make it atleast a day or 2 in advance. I store it in an airtight container at room temperature. The most I’ve stored it for us a week, and it still worked well. Let me know if you have any other questions and happy birthday to your daughter! I want to make a suggestion that for your additional offerings please list what the photo is all about as it’s hard to tell. Your site is so lovely and the lettering & layout is calming! Can’t wait to make the finger paints!